Becky June 3, 2017 July 6, 2017 No Comments on Enjoying some peace and quiet? We made our way down from the Brecons to spend a couple of nights in a campsite, we had a few sweaty garments to wash and a few tweaks to make to Bertie so access to a washing machine and mains electricity were going to be useful. The north side of the Beacons is definitely more bucolic than the south, with whitewashed houses, farms and winding lanes – amazing how the landscape can change. We stayed in a camping and caravanning club site – expensive and I’m not convinced that membership has been worth it. But hey ho, we’ve been members since summer last year and every now and again we get a discount on something. 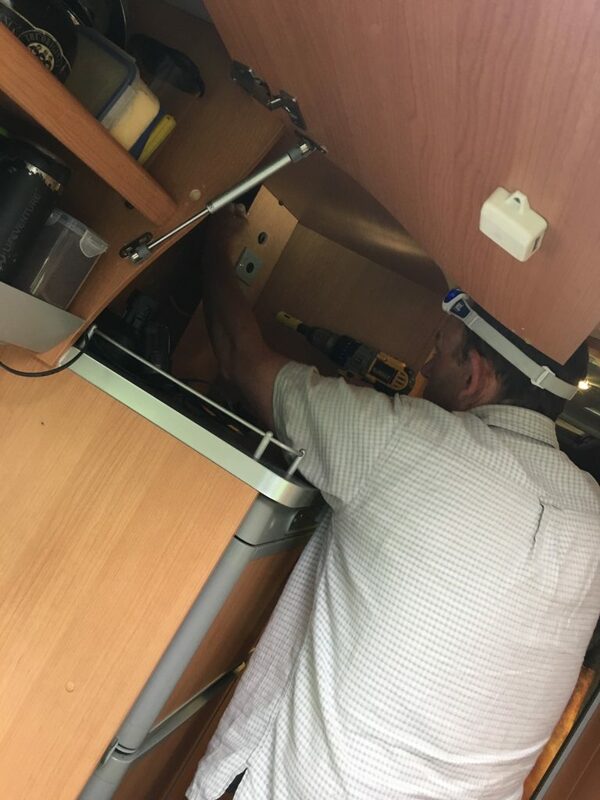 Paul fitted some additional 12volt sockets in Bertie. We have a few 12v sockets already, but they are European style sockets and we only have USB adaptors for them. Some of the appliances we’re running on 12volts (ie the laptop) have chargers that need a British (cigarette lighter) style socket. So Paul picked up a couple from Halfords, cut a few holes in Bertie and set it all up. I’m glad he feels confident doing this type of thing as the thought of operating on Bertie makes me quite nervous. The addition of these sockets will allow us to be more independent and require a hook up less often, which will be good for the budget. We had been warned that the campsite was very ‘away from it all’ so we knew there wasn’t going to be any phone reception or 3G/4G signal. We didn’t think it would be a big deal. However we realised that we do like a bit of background music, and there was no radio reception. Never mind, we thought we had some tunes on our phones – but actually we didn’t. Owing to previously having a phone with very little memory I’d tidied up my music, this meant I had a very small and odd selection of music available to me – none of which were appealing to Paul apart from David Bowie’s greatest hits, which we became very well acquainted with. We’ll be better prepared next time!. 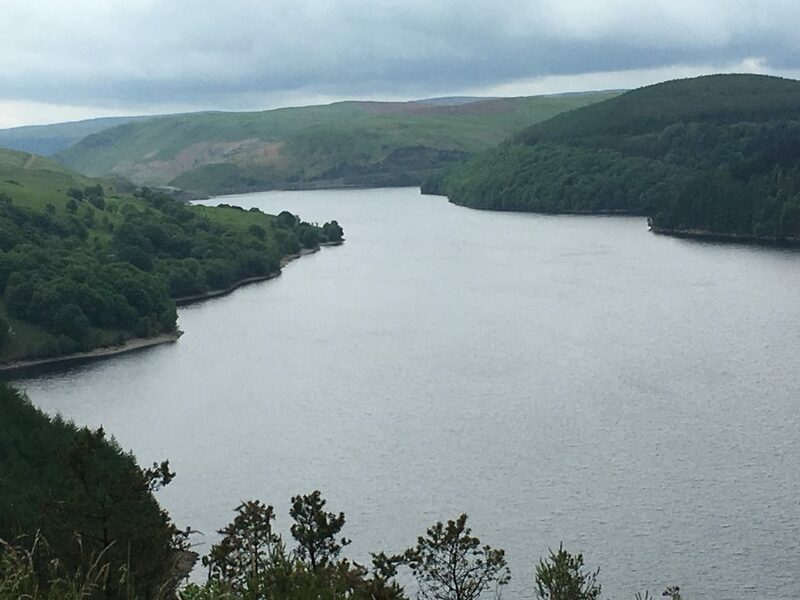 We did manage one good long bike ride from the campsite up (and up, and up, and down a bit, and then up again…you get the picture) to Llyn Brianne, a large reservoir spreading across a number of flooded valleys. The long slog was worth it though when we spotted Red Kites flying over the lake and forest. We also found one spot where we could get some signal and stood by the side of the road doing a spot of admin – may have looked a bit odd to passing traffic, if there was any.